Day report for Uptown Radio, originally aired February 17, 2012. HOST INTRO: Since Whitney Houston’s death last Saturday, fans around the world have mourned the star many call the “Queen of Pop.” In New York City, fans have been gathering in front the Apollo Theater in Harlem, where they’re building an impromptu memorial. 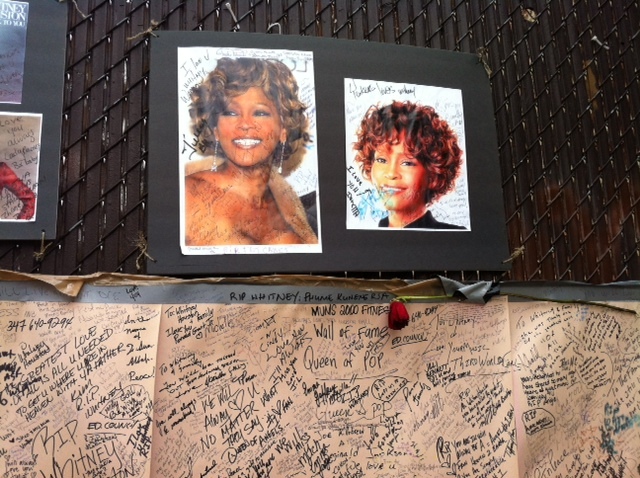 RUSSELL: There’s a growing shrine of roses, photos, balloons and candles on the sidewalk in front of the Apollo Theater. Fan Therese Todman says she felt it was important to come. SOUND: Fade up and under narr, “Greatest Love of All” by Whitney Houston. RUSSELL: Also here is retired teacher Mary Ann Sussoni, who says she used to play this song for her students. She’s surprised at how hard she’s taking this. RUSSELL: Sussoni says it’s been an emotional week. She found herself writing poetry about Houston on the subway ride to the memorial. Some visitors, she said, were more cynical. RUSSELL: Local musicians have come to pay their respects too. Lord Harrison is a rapper who comes to 125th street to promote his group. He says he’s signed the wall several times since Saturday. RUSSELL: Like so many fans at the Apollo, Harrison has a personal relationship with Houston’s music. RUSSELL: Mahla says fans started coming in so soon that there was no time to create a display of Houston’s records and films. RUSSELL: Mahla says customers had no preference for a specific album or song, but many have the same favorite. RUSSELL: That was her hit from the movie “The Bodyguard,” I will always love you. Houston’s funeral at New Hope Baptist Church is invitation only, but the Associated Press will live stream the service on their website tomorrow.